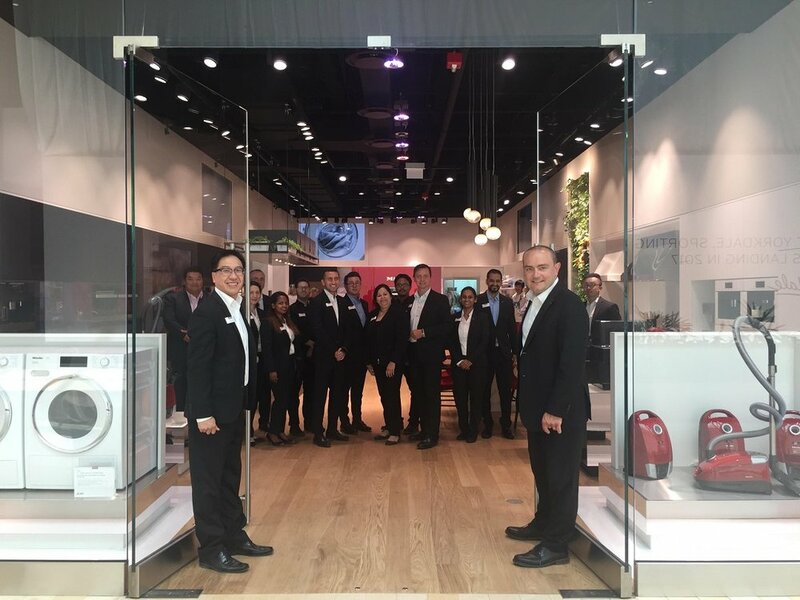 High-end appliance brand Miele has unveiled a new first-in-the-world interactive ‘Miele Experience Centre’ flagship at Toronto’s Yorkdale Shopping Centre, which will act as a prototype for future Miele locations in major markets globally. The highly experiential space could represent the future of experiential retail, which includes an interactive experiential component and even food that is made and served throughout the day. Yorkdale’s Miele Experience Centre is highly interactive — visitors are encouraged to try out appliances ranging from laundry and floor-care appliances to kitchen products through to ‘Smart Home’. It almost feels like a technology playground while at the same time, being a retail store where customers can buy the products. As with many homes these days, the store’s kitchen area is the ‘heart and soul’ of the new store. Several times a day, a chef demonstrates cooking and baking in the dedicated space and as an added bonus, freshly prepared culinary treats ranging from croissants to homemade soup to pasta can be sampled by customers during their visit. There’s a lounge area adjacent to the store’s kitchen that encourages one to pause and enjoy. 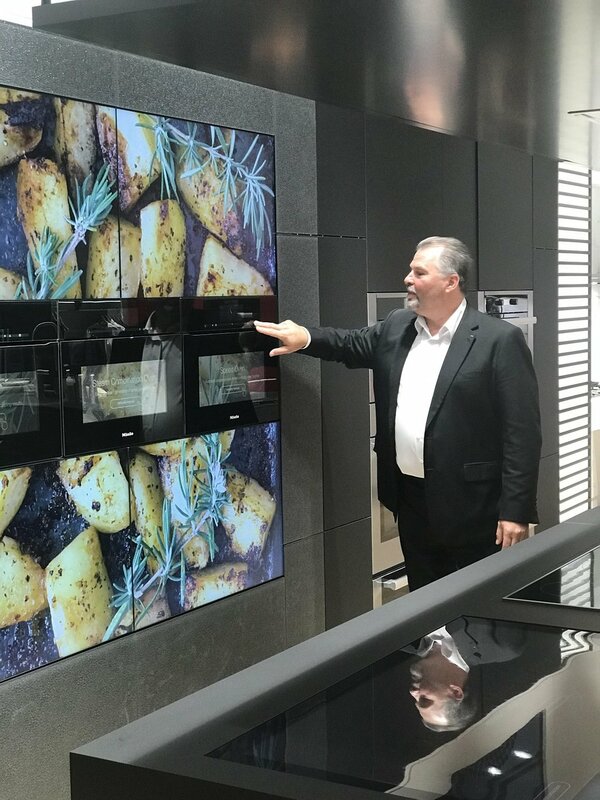 Technology, including various digital elements, are an important part of Miele’s new space — ambient lighting and videos change with the time of the day, with five video screens grabbing the attention of visitors. Interactive displays throughout the store showcase the latest in Miele technology. At the ‘Swiping Cooktop Screen’, it’s possible to perform virtual cooking and to experiment with the various Miele induction cooktops on display. A 46-inch touch screen display on the ‘M-Touch Wall’ shows the product range with the eponymous technology in full size and illustrates the function of the controls which simplify the operation of numerous built-in appliances. This is new to Miele, as is the ‘Miele CareCollection Consumables Wall’ which, with the aid of short videos, informs visitors about Miele’s various cleaning and care products. Visitors can launch video demonstrations by simply scanning items using the NFC scanner provided. 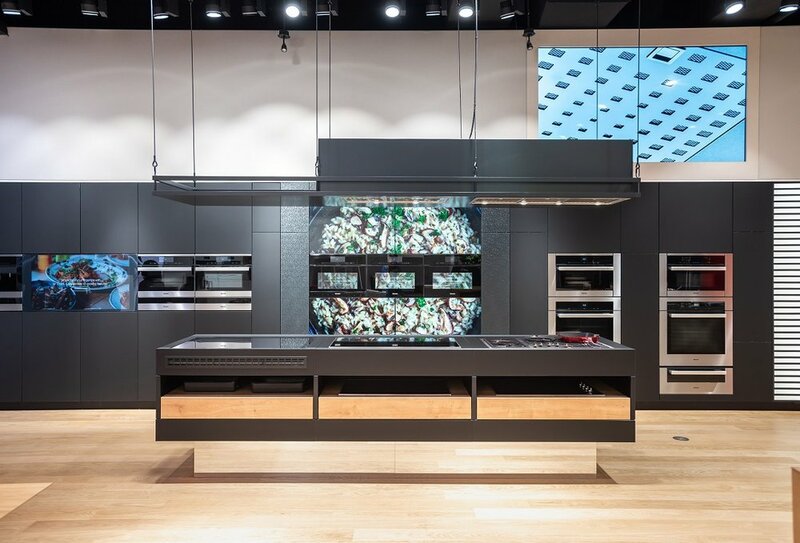 Brand/retail consultancy FITCH designed the storefront as well as the series of playful, interactive spaces created to enable guests to explore and experience Miele products in action. What’s interesting is while this store is ‘direct-to-consumer’, it’s not in competition with other retailers that sell Miele products. Miele utilizes a chartered agency system, where all products sold in third-party retailers actually interact with Miele itself. As a result, someone shopping at a multi-brand retailer might go to the Yorkdale location to test out some products, and Miele is able to track if the consumer came from that multi-brand store. The store is Miele’s first ever to be located in a ‘premium shopping mall’ according to the company (Miele’s Calgary, Montreal, Toronto and Vancouver Experience Centres are in less-prime locations), and Yorkdale makes sense. The shopping centre is home to more luxury brands than any centre in Canada and the clustering has led to a loyal base of shoppers that are also considerably wealthy. A representative from Miele noted that in some instances, a Miele chef will attend a purchaser’s home to show them and any domestic staff how to use appliances, including creating a multi-course meal for educational purposes. Miele representatives also explained that Yorkdale was chosen because it’s a busy mall with about 18-million annual visitors. 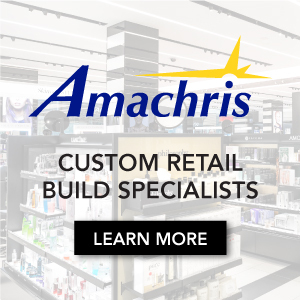 The mall is also Canada’s most productive in terms of annual sales per square foot, which may continue to be the case as another Canadian Shopping Centre Study is in the works for 2018. 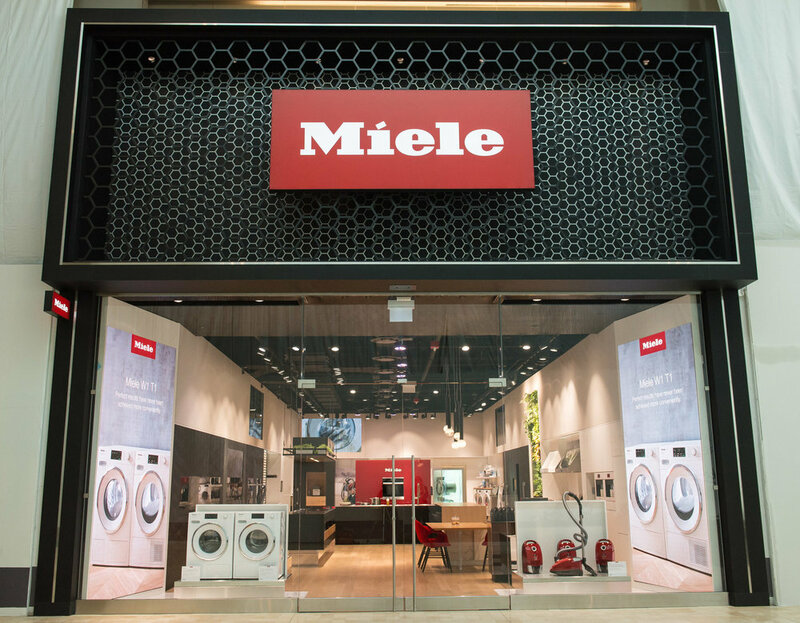 About 30-40 more Yorkdale-like Miele Experience Centres are expected to open globally in the world’s major centres. Yorkdale is expected to be the only such experience centre in Canada, however, according to the company. Miele is considered to be the world’s leading manufacturer of premium domestic appliances including cooking, baking and steam-cooking appliances, refrigeration products, coffee makers, dishwashers and laundry and floor care products. The Miele company was founded in 1899 and has eight production plants in Germany as well as one plant each in Austria, the Czech Republic, China and Romania. Its annual turnover in 2016/17 was about 3.93-billion Euros with sales outside of Germany accounting for 70% of that amount. Miele is represented with its own sales subsidiaries and via importers in almost 100 countries — the Miele company, now in the fourth generation of family ownership, employs a workforce of around 20,200, with 11,200 of those being in Germany. The company headquarters are located in Gütersloh/Westphalia, Germany.